Pinhole photography is lensless photography. A pinhole camera is a light-tight box or container with a tiny hole at one end and film or photographic paper at the other. Through the hole, rays of reflected light thrown from the exterior world enter the box and form an image. As light travels in straight lines, the projected image appears upside-down inside the camera. Pinhole cameras are used for fun, for art, or for science. Pinhole cameras are small or large, improvised or designed with great care. Cameras have been made of seashells, of salt shakers and watermelons. Many have been made of circular boxes, coke cans or cookie boxes; and at least one has been made of a discarded refrigerator. Cameras have been cast in plaster like a facemask, constructed from beautiful hardwoods, built of metal and fitted with bellows. Station wagons have been used as pinhole cameras, as have rooms in large buildings. Some photographers delight in making cameras out of surprising objects. But most pinholers start out with a simple cardboard box or a small circular metal or cardboard container. What counts in the final analysis are the images produced by the camera. Extraordinary images can be made with a very simple cardboard or can camera. Some images could not have been made with a lens. The pinhole itself, the most important part of the camera, is basically a sophisticated lightleak. The hole is usually made with a needle in a thin piece of metal, e.g. heavy aluminium foil, brass shim or metal from the lid of small glass containers found in many shops (at least in Norway, where I live). The hole should be round and the edges thin and sharp. Place the piece of metal on some cardboard or wood, push the needle carefully through the thin sheet of metal, then sand the metal to remove burrs. If you use metal from a container lid, you should sand both sides of the metal before making the hole, in order to make the metal thinner. Each camera has an ideal pinhole diameter, depending on its focal length, which is the distance between the hole and the film or photographic paper. A number of formulas have been produced to calculate this. 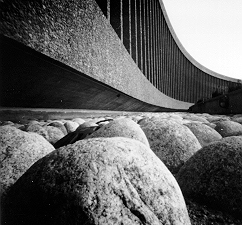 Generally speaking, a smaller pinhole will give a sharper image than a larger one. If the pinhole gets too small, however, the image becomes less sharp because of the diffraction of light. Pinhole cameras may have one pinhole or several. A camera with multiple pinholes produces overlapping images. Some photographers experiment with a slit or a slightly blurred hole instead of the defined and circular pinhole. A pinhole camera may take film or photographic paper. In general pinhole negatives do not tolerate much enlargement. Best results are therefore usually achieved on medium format or large format film – 120 roll film or 5 x 4-inch sheet film. Film generally produces sharper images than paper, but photographic paper is also an excellent material for initial experimentation. If the film plane is flat, the image may be overexposed at the centre and underexposed at the corners. Many pinhole photographers exploit this as a particular aesthetic effect, with blurry edges. A curved plane, however, keeps the film roughly at the same distance from the pinhole, and the light is more evenly distributed. Because the pinhole is small, very little light enters the box. Consequently, the exposure time, the period of which light is admitted through the hole, is long – often 100-400 times as long as with a normal camera under the same conditions. Exposures can range from half a second to several minutes, sometimes hours. The aperture or f-stop can be calculated by dividing the focal length by the pinhole diameter. Photographic paper has a far lower ISO rating than film (e.g. ISO 6) and requires longer exposures. Pinhole photographs are softer and less sharp than pictures made with an ordinary camera. The pictures have infinite depth of field – everything is “in focus”. Objects that are 5 cm from the camera will be equally as sharp as objects several metres away. This cannot be achieved with an ordinary camera with a standard lens. With an extreme wide-angled pinhole camera, lines at the periphery of the pictures remain rectilinear – while with an ordinary camera with an extreme wide-angle lens, a flagpole or a tree far from the centre of the picture will be curved. In other words, some pictures made with a pinhole camera could not have been made with a lens. 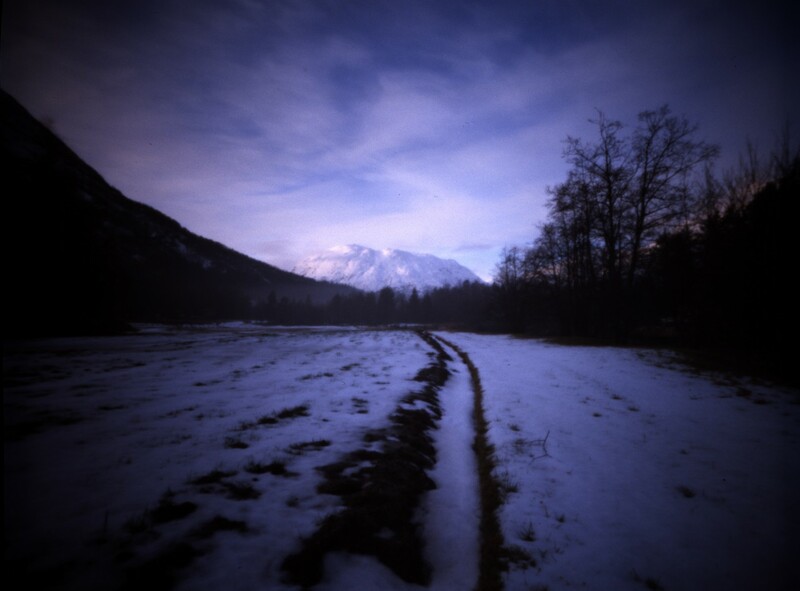 A pinhole camera can be an excellent instrument for “subjective photography”. For “liberating our perception from automatism” and “making things strange” in order to help us see – if I may borrow a few concepts from Viktor Shklovsky and the Russian formalists in the early 20th century; concepts which are as important today as they were then.